Sauce Hollandaise is the French name for "Hollaendische Sauce (Dutch sauce)" and it is a classic sauce for many different dishes. In German we also call it "helle" or "weisse" Sosse. 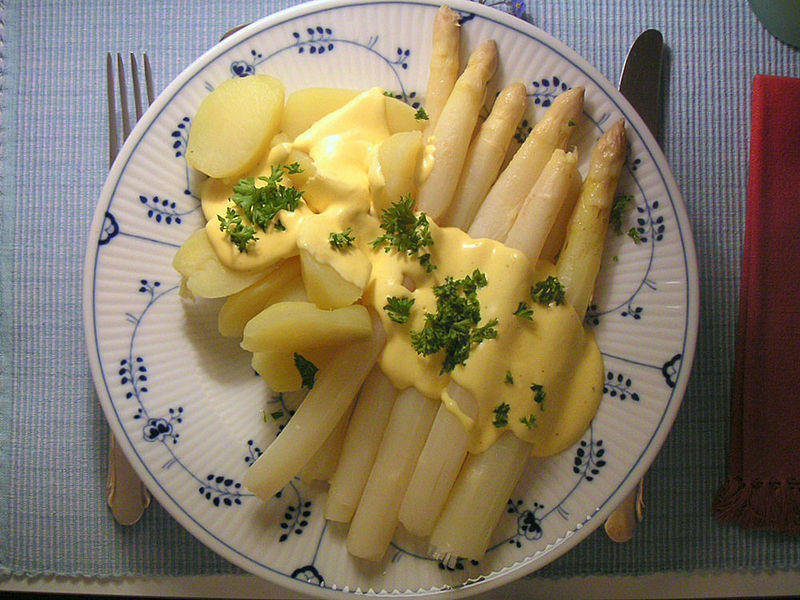 The sauce Hollandaise is a must with asparagus - great combination - but also with meat, fish and other vegetable. This is the original recipe. It is not using broth or any other liquid to make it. Happy Cooking! - melt butter but don't let it get too hot as you will ad an egg! - place egg with lemon juice water and salt in a pot and use double boiler method. - whisk until you get a creamy sauce (very important otherwise the sauce will coagulate). - now add spoon by spoon the melted butter while stirring continuously by using a whisk. - spice with salt and pepper. Serve over asparagus. The sauce should NEVER get hot otherwise it will be messed up. So use mild heat. Use less butter for less richness.